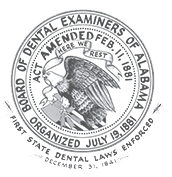 According to the Code of Alabama, the practice of dentistry was deemed to “affect the public health, safety, and welfare.” To protect this public interest, the Board of Dental Examiners of Alabama was created by the Alabama Dental Association in 1881, the first such regulatory body for dentists in the nation. The inaugural meeting of the Board of Examiners took place at Lotus Hall in Selma on July 19, 1881. Elected to the first Board were the following: Drs. E. S. Chisholm (Chair), W. R. McWilliams, F. M. Allen (secretary), and W. D. Dunlap, and J. G. McAuley. Also at the initial meeting, the Board chose the seal still used today- the coat of arms of Alabama, with “Board of Dental Examiners of Alabama, organized July the 19th 1881” engraved on it. But more importantly, they began reviewing applications for licensure, approving some and rejecting some. The 1882 meeting took place in Montgomery on April 9-11. Secretary Allen reported to the Board that his “labors (had) not been light” during the previous year and that he had worked with an insufficient budget. He made up some of the deficit out of his own pocket, but at the year’s end, he was able to report a balance of fifty-two cents. By the end of the second meeting of the Board of Dental Examiners, rule and regulations governing the Board had been adopted. New applicants for licensure had been approved, and those rejected were sent off to study more before receiving the imprimatur of the Board. In subsequent years during the nineteenth century, the Board met annually to approve licenses. It never acted as a rubber stamp, always turning down some of the applicants. In 1897, 1898, and 1899, the work continued as usual, and the numbers of applicants examined were growing. Under the leadership of Chairman E. S. Chisholm and secretary G. M. Rousseau, the organization seemd to take stock of itself and get new bearings. Dr. Chisolm reported to the Alabama Dental Association that “it affords the Board gratification to state that the gentlemen who have been examined by us stood a closer and more thorough examination that has ever been given by the board.” In addition, the board tightened the requirements for temporary licenses and issued a new directory of Alabama dentists. 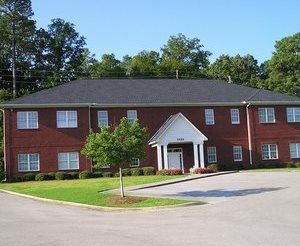 As the century turned The Board of Dental Examiners of Alabama was well established, continuing to accomplish the task it was charged with when it was organized in 1881: to protect the public’s interest and insure quality dental care in Alabama. This narrative provided by Stanley Michael Mahan, Jr., D.M.D.